After 1980’s Hotter Than July, Stevie Wonder’s reign on the charts slipped into a brief period of commercial success before slidding into comatose. That didn’t mean his music had deteriorated. It just was overshadowed by ambassadors of MTV and the next generation of pop stars. The critics and the world over raves about Stevie Wonder during his Grammy-magnetic era: the Seventies, or better known in Stevie terms; the “classic period.” And there’s no disputing just how awesome this Motown-bred talented singer/songwriter was to the realm of R&B and at large, pop music. 1972’s “Superstition” made funk accessible; “Higher Ground” revolutionized the gospel crossover; “I Wish” and “Sir Duke” linked ‘70’s soul with joyous Big Band reflections; “Master Blaster (Jammin’)” gave Bob Marley permission to invade American soil. Simply put, there’s no denying the greatness of this great patriarch of R&B within the context of the Seventies. The Eighties for Wonder, on the other hand, happened to be one of the eras often neglected and compromised. With pop music revolutionizing into a super hybrid dominated by New Wave and rock-pop and inspired by the next generation of torchbearers, Wonder hardly was left any room to shine. Those with an acute memory of the 1980’s only noticed his bubblegum pop anthem, “I Just Called to Say I Love You” and maybe can recall his heroic activism to honor Dr. Martin Luther King with a national holiday during the conservative Reagan years (The moving epitaph “Happy Birthday” was born from this). Sure, “Part Time Lover” and “Ebony and Ivory” – a duet joining him with Paul McCartney promoting racial harmony – became No. 1 pop hits, but no one hardly acknowledges this period because of the shining influence of his early work left upon the heart and souls of next-generation musicians. And maybe the pop-rock media cyclone of MTV just wasn’t ready to embrace a blind black man wearing shades, bobbing and weaving precariously to the drum-programmed beats of Wonder’s transitional soul. Still, the mighty Wonder designed some very exceptional tracks in this decade, although most of them were overlooked and neglected even by his own constituents. When the Nineties arrived, tougher times awaited Wonder. The music of the younger generation changed yet again. Black music got meaner, thicker, more urban. The West Coast rap scene even ushered pop megastar Michael Jackson into the urban dungeons of Teddy Riley, R Kelly and Darkchild, just to prove he was still black. This didn’t leave Wonder much room to play with pop, nor did it allow him many opportunities to record. The only idea he could fully embrace during this period, which continues even to this day, is his claim to ambassador status. Today, he tours when necessary, usually to arena-size crowds, and cranks out the oldies with a fiery crunk. He’s hardly aged since the Nineties, and leaves us all to ponder if he has any motivation to squeeze out another album like he did with 2005’s A Time to Love. Only time will tell. In the meantime, Wonder’s music of the Eighties and Nineties probably wouldn’t stand a chance against his most creative period, where he was the primal influencer. Clearly, the music of his latter period reflects a musician utilizing the newer influences around him and leaving him in a much uncompromised position to produce music of the times. Still, some of the tunes of this era manage to soar beyond the dust gathered on the legion albums of midgrade R&B. And this 12-track list will certainly prove just that. 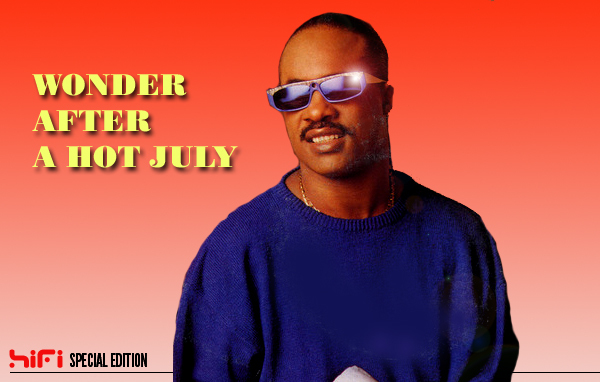 So from HIFI – your friendly announcer, experience the best of Stevie Wonder after Hotter Than July. All you need is an ear and a little love today and don’t delay. Wonder typically shied away from movie soundtracks during the Seventies, leaving Curtis Mayfield and Isaac Hayes to handle those Hollywood errands. The Eighties brought on new assignments for Wonder, including his task to helm the music for the hit film The Woman in Red. But it is Wonder’s work on the soundtrack for Spike Lee’s Jungle Fever that is most remarkable. “Gotta Have You,” the infectious album opener, continues the Michael Jackson post-disco grooves, while exhibiting his best exploration of New Jack Swing.